I am finished with this quilt! And I can't wait to start another one for the series. If you scroll down to November 7th post below, you can read how this one came about and see my final revisions in the one above. It all started with a stamp that I carved. The size is 9" x 22 1/2". 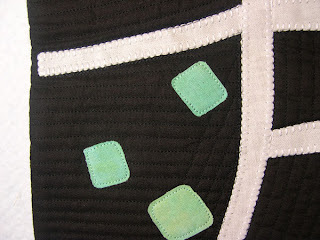 I added more quilting lines after I found more of the same black thread and rearranged the squares falling. And today is.....Happy Birthday to my good friend, Susan! She's an amazing artist! Today is our son's birthday! Above is a picture of him that we have always loved. 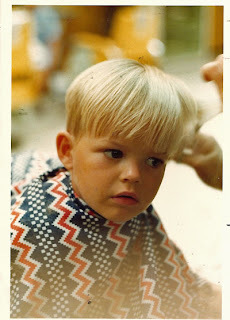 He is getting a haircut from a Japanese barber when we lived in Okinawa, Japan. This was his first "official" haircut and he was about 2 years old. He wanted to get a haircut just like his dad's. He sat so still the barber was amazed. He is now 34 years old! Wow! time flies! Happy Birthday, Matt! Here it is, all quilted and finished. I will mount it on stretched canvas to hang it. (I have two canvases painted and drying..different colors.) You can click on the picture for a detail. 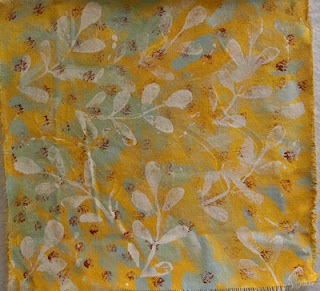 It's only 5"x 7", hand dyed and commercial fabrics. I machine quilted heavily. I don't have a name for it, yet, but this is the one I kept thinking of each morning and never got around to making. I really like this one! 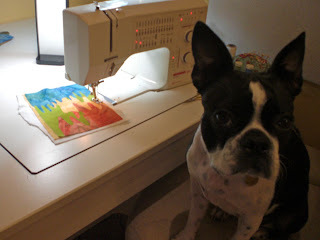 It was fun to quilt, too. I may even rotate it before I'm done, haven't decided, yet. I received some emails asking about the basket weave throw I am knitting. I am using a pattern from a book, but I found lots and lots of free patterns for it on the internet. Here is a pattern that is similar to mine. 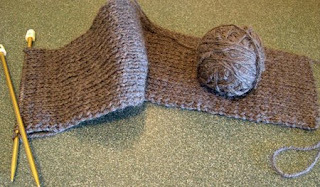 Basically, (with disclaimers for my "oh, no, I hope I explained that right") this is it with changes for a larger size: Acrylic yarn, worsted; size 9 circular needles, 29". CO 164 sts. For the border, I first knitted 9 rows of garter stitch. Then, I began the basket weave pattern. Basically, it is: k6, p4, k4 until 6 stitches left and then knit 6. The k6 on each end start the side borders. 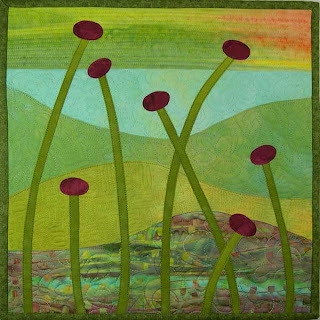 (You could do a seed stitch border, instead.) You can make the basket weave rows as wide or long (tall) as you want. I think mine has 6 rows of basket weave stitch and then three rows of garter stitch between. Mine is not really reversible, but that's OK with me. I would suggest alternating the sets of k4, p4 after 6 rows instead of putting garter stitches between them. Then, it's reversible. I hope this explanation helps. 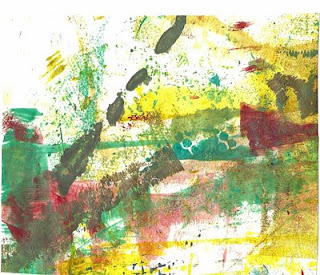 Here is a blog that has a really good picture and pattern. Anyway, it really is an easy pattern. It's fun to knit, too, not boring. I'm still knitting it, but loving it. Let me know what you think. Whew! What a day. Yesterday, in the middle of finishing the first of my ladder series, I ran out of black thread. You would think any black thread would do, but no, of all the many spools I own, it all looked grey compared to the #105 Mettler silk finish 50/3 cotton thread that I had used. So, being so late in the day, I couldn't just get up and run to JoAnn's to get more thread. Not here in the DC area. For one thing, we don't have a JoAnn's Etc....only the regular JoAnn's who mostly store fabric and trashy things on the floor. This area is so large that you would think they would open a JoAnn's Etc. Instead, I put my project away until I could go to G-Street fabric today for the thread. 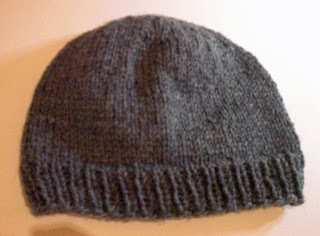 So, I knitted last night and finished this wool/acrylic hat for a surprise for someone having a birthday this week. This is my first hand knit hat, ever! First time to knit in a circle using circular needles and double pointed needles. I really like using the double pointed needles...there are 4 needles going at a time...amazing to me that I can keep them straight. Really, if you knew how klutzy I am, you would know it is a feat. Back to the thread...When I do get out in the traffic, I like to make a day of it and run all my errands, so that is what I did today. I went to Target for supplies, got gas for the car and dropped off cleaning at the cleaners. I was tired when I finally made it home. Actually, if I time it correctly, the traffic isn't too bad...usually. But it does make me miss Ohio where I could run to JoAnn's for thread and run back home and back again if I wanted without delays. But, good news is, I get more art accomplished here in VA. The piece on the machine above is being machine quilted. (Emma has to jump in my chair whenever I get out of it). I will hopefully finish the piece tonight to post tomorrow and tell you how it came about. Ever have one of those designs you just had to make to get it out of your thoughts? Well, this is one. That's why I started it as soon as I got home today. Paula, I see the man fishing too! Thanks for your comments! Susan, I will post my version of that pattern or email it to you. What's the scarf like that you are knitting? Cheryl, a sweater! That is one of my goals, too. I'm off to make veggie soup for dinner (cornbread, too...yum). Today, the SAQA auction opens and "Pods Revisited" is up for sale. It can be found on this page. Bidding starts at $750 and it is a reverse auction. 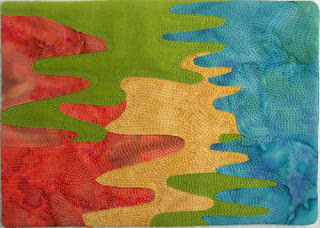 There are lots of beautiful quilts (all 12" x 12") on the auction pages, so please take a look. As I said yesterday, I was quite surprised to see the images that were left on my worktable covered with freezer paper. 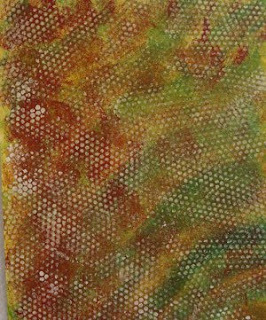 This is after a day or two of using Golden acrylics, gesso, glazes, etc. I cut the freezer paper up. In the image below, I outlined the birds (one on a tree limb and two blue birds in the grass below), mountains and tree. The image below looked just like a bottle with a cork. 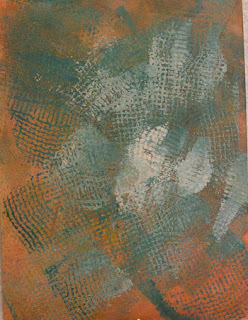 I haven't figured out the one below...maybe just an abstract. I wonder if I can get these onto fabric? 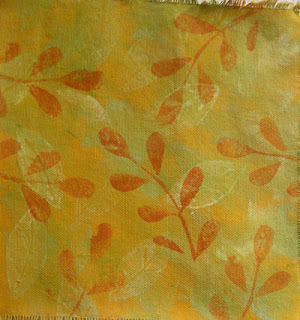 I do have the ink jet fabric transfer sheets. I will have to get a new printer cartridge and try it. OK, I had fun with these...maybe I need to get out more. Here was my work table before I cleaned it up. When I took up the freezer paper that is covering it...Serendipity! See how painted and stamped and covered in paint? I cut it into usable pieces to stitch and glue onto quilts. 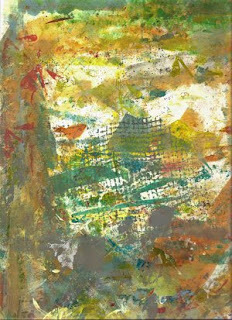 Then I began to see images in the painted freezer paper. There are three birds, at least. 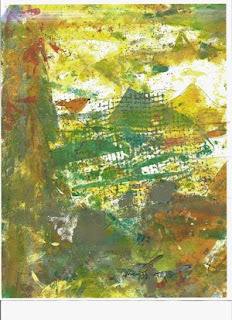 Tomorrow, I will post the piece that looks like a forest scene with mountains and trees and birds. That bit of aqua netting on the right is a piece of plastic net bag I cut from a bag containing Vadalia onions. It made a great stamp. 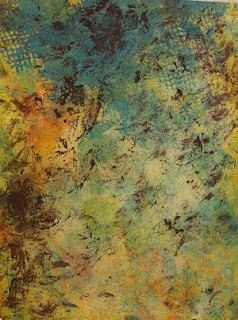 I put paint on it and then flipped it onto the canvas and used a brayer on it. OK, I know I posted twice today, but had to show off my work table. I'm off to work on a quilt (or two). This is a wool scarf that I am currently knitting for a Christmas gift. It is 100% wool...warm! I am knitting the ribbing stitch, so it is slow going, knit one, purl one and sometimes is a bit boring. This is the other knitting project...a throw. 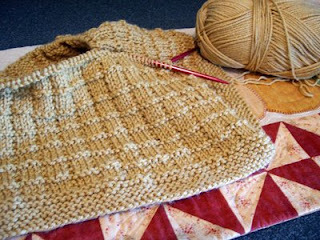 It is really a soft gold color knit in a basket weave stitch. Soooo easy! If anyone wants to know how it's done, leave a comment. I am just a beginner knitter, so believe me when I say it's easy. It makes it's own border on all four sides. 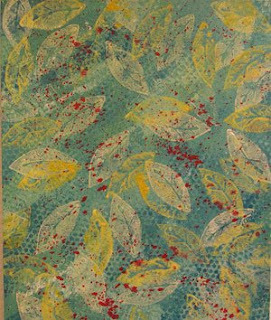 The nice thing is after I had started this one, I saw one just like it in the new Better Homes & Gardens magazine in a decorating article. Who knew? The nice thing about my knitting is that it doesn't take away from my quilting. I usually just knit at night after a long day in the studio. Any other quilters out there who knit? If you like free patterns and inspiration, then go to http://www.ravelry.com/. It is a knitting, crochet on line community that is so cool. When I do go there, I get lost in all the neat things to see or make. This is a beginning of a new series. The one above is just an audition pinned on my design wall. It is already machine stitched and quilted. 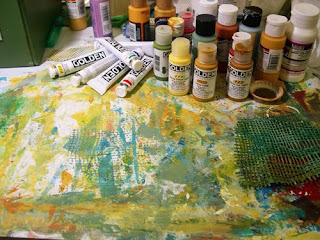 I don't know if the "paint chips" (just pinned on) will stay or go. I may try something else all together. But it has been pinned to my wall for about a week, now and I need to finish it. Below is the "blank" version waiting for another audition of added accents. I'm still working on the composition and will add a focal point. This is the stamp I carved from an eraser that is the start of my new series which I will call the Ladder series. Sorry, the above picture is a bit blurry as the eraser is only 7/8" x 2 1/2". The quilt is 10" x 23". I used one of my favorite tools to enlarge the stamp into a quilt design...my overhead projector. You will see more of this series later as I work on it. Leave me a comment if you want. I love reading them! These are all backgrounds made on 140# watercolor paper. 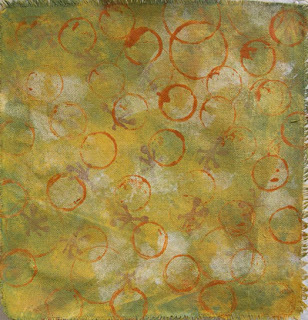 I used the same process as making the canvas backgrounds yesterday. Fun! Can't wait to stitch these into a collage. 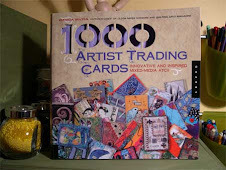 These are made from artist's canvas, painted and stamped with Golden Acrylics, Golden's Acrylic Glazing liquid and the "other" acrylics which you can buy for less than $1. 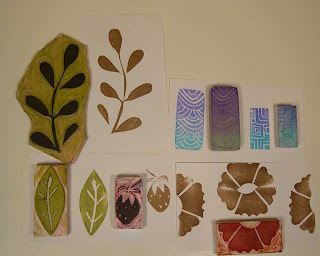 I even used some of the stamps I carved which you see in the photo below. 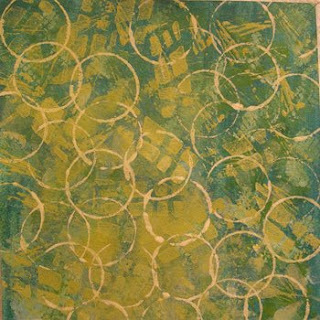 The large circle is the lid from a baby food jar dipped in paint. 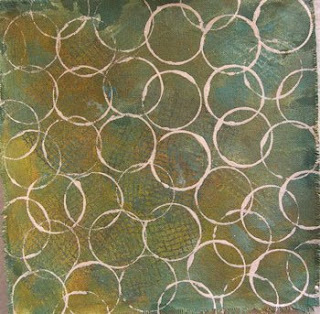 It's easy to machine stitch on this canvas, too, which will come later in the class when we build collages. 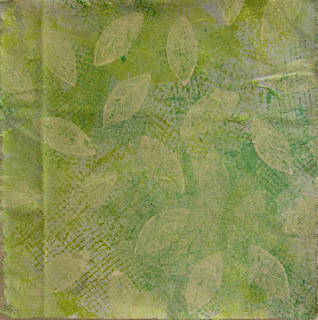 Tomorrow, I will post the ones I painted and stamped on 140# watercolor paper, so stay tuned for more fun creations. 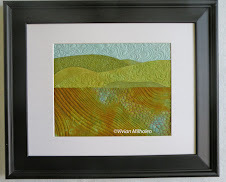 You can stitch on paper, too.